The origins of Roulette are rooted in mathematics and literature. The name of the game literally means “small wheel” and that wheel first belonged to a French physicist and mathematician in the 1600s named Blaise Pascal. He was actually chasing the age-old dream of a perpetual motion machine but instead, his wheel became the model for the first recognizable roulette wheel that appeared in the Palais Royale Casino in Paris in 1796. The gambling game of roulette borrowed from Pascal’s wheel, as well as elements of other ancient wheel-based games such as Roly Poly and Reiner that had long been popular in England, and Biribi and Hoca that were spun in Italy. The wheel features alternating black and red slots but the numbers do not run around the wheel sequentially. Instead the numbers are grouped in such a fashion as to create sections of the wheel with approximately equal values. Any odd number between 1 and 10, and 19 to 28 is red, and the even numbers are all black. From 11 to 28, and 29 to 36, the pattern reverses and odd numbers are black and even numbers are red. Roulette caught the fancy of French gamblers almost immediately. In 1801, a spirited rendition of the game was featured in a novel by Jacques Lablée called La Roulette, ou le Jour , introducing the wheel across Europe. French brothers François and Louis Blanc were running a small casino in Hamburg, Germany in the 1840s when they decided to liven up the game by spinning a wheel with just one zero slot, slicing the house edge from 5.36% to only 2.70%. The Blancs were indeed doing great business but the German government snuffed out gambling in the 1860s so the brothers packed up their wheel and left for Monte Carlo. There they were instrumental in establishing the Principality’s first casinos and single-zero roulette was the star of the show. It remains the European standard today. There is little a Frenchman from the 1800s would not recognize if he sat down at a roulette table today because it’s barely changed at all. The betting field is laid out in a 3×12 grid and the numbers 1 through 36 snake sequentially through the grid from the upper left corner to the bottom right corner. A block for the zero and double zero, if used, are inserted at the head of the grid. In the field outside the grid are betting spaces for groups of numbers with their payouts. Straight Bet: Chips placed on a single number. Street Bet: Chips placed on the line at the beginning or end of a row that put all three numbers in play (1-2-3, 4-5-6, etc.). Split Bet: Chips placed on two adjoining numbers, either vertically (1-4) or horizontally (1-2). Corner Bet: Chips placed at the intersection of four numbers (1-2-4-5). Trio Bet: Chips that cover the 2, zero and double zero at the top of the grid. Basket Bet: A bet with the zero and 1-2-3, depending on how the betting field is configured. 1-18 Bet: This wager covers the lower half of the 36 numbers. 19-36 Bet: This wager covers the higher half of the grid. Red or Black Bet: These chips back the ball bouncing into either a red or black slot. Even or Odd Bet: A wager that the ball win nestle into either an even or odd numbered pocket. Dozen Bets: These groupings enable wagers on the numbers 1-12, 13-24 or 25-36. Column Bet: Carries the same odds as a Dozen Bet but the numbers in play are the ones in any of the three columns. Snake Bet: Another Dozen Bet variation with the numbers 1, 5, 9, 12, 14, 16, 19, 23, 27, 30, 32, and 34 as they twist through the number grid. When offered, players can set chip stacks on a snake head to make this play. The genius of roulette is the addition of the zero and double zero spots on the wheel. Players make even-money bets and can instantly double their money…without noticing the House is collecting handsomely. This is due to the fact that every now and then the ball finds a green-colored home and not red or black. 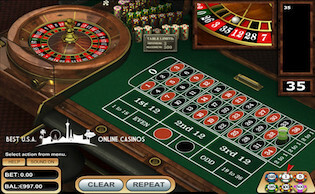 This casino table game has spawned many betting systems by players who are determined to beat its 50/50 nature, with the most popular being the Martingale System, which instructs the player to double the bet after every loss. The thinking is that the hefty wagers will eventually pay off and cover all of the losses that have come before. However, the increased wagers and those losses can starve the bankroll before the salvation spin ever shows up, so it’s not a recommended strategy to employ. Also, some players track the results of the wheel in search for the “hot numbers” or outcomes that are “due”. Such thinking may be comforting and casinos are more than happy to post the recent numbers to help these superstitious players in their quest for a pattern. However, the outcome of the current spin is completely independent of everything that has come before it, and the result is the essence of random chance. Finally, as long as silver balls have been bouncing around roulette wheels, gamblers have accused operators of guiding the balls into preferred sections of the wheel. Shady croupiers and unbalanced wheels may have been actors in a colorful gambling past, but today’s wheels are engineering marvels devoid of such shenanigans. You can play with confidence both in person and online: they are not a scam and are 100% safe to play. 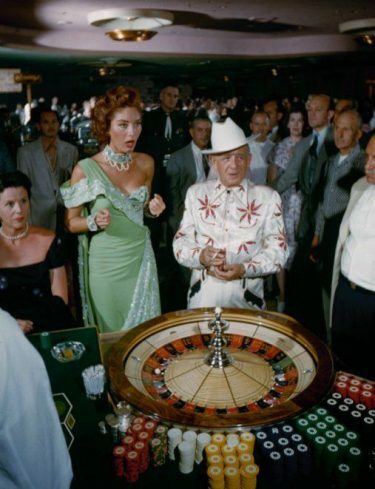 When roulette came to America it was the double-zero wheels that were packed onto sailing ships, so today the gambling world is split between European Roulette and American Roulette. All game play and payouts are the same, with the only difference being the meatier house edge in the American version. The citizens of France were not about to let their history in the origins of the game be washed away in anonymity, and as a result there is a variation called French Roulette that is even more player-friendly than the others. Any player who makes the “even money” bet (even or odd, red or black, 1-18 or 19-36) will only lose half the original stake should the ball tumble into the dastardly zero pocket. Rather than take the stake, the player can leave the bet “imprisoned” for the next spin. If that spin results in a win, the full bet is returned. Some places will go even further and continue after losing spins with “double imprisonment” and will then collect the full bet. Imprisonment can sometimes continue until the wheel delivers a non-zero verdict. When imprisonment is used with the double-zero slot it is considered to be “Atlantic City” rules. You can draw your own conclusions on how that term originated.